This attachment contains the voluming and contouring guidelines that I use. I would be grateful if you told me if you find that the document is erroneous in any way. You will see that I have adopted a naming system that eventually simplifies planning. The process starts with definitions of GTV. The primary GTV is called GTVp, and the nodes are called GTVn. Should you wish to label the nodes individually then use GTVn1, GTVn2,….. feel free! this expansion method is more difficult and relates gross disease (more for the primary than nodes) and recognises local infiltration which may or may not be restricted by fascial/bone/cavity/air boundaries. The extent of this depends on what you drew for your GTV! If you draw your GTV around any alteration in the CT image, then your expansion will be into NORMAL TISSUE and can be quite confined (?around 3-5mm), whereas if you keep your GTV to the mass and exclude the hazy fat area beside this, your expansion is going to be very large and you will want to trim it back in areas where there is obviously no evidence or possibility of involvement … BUT (there's always a but!) … if you do both properly the CTV should end up in the same place because both are based on an image and a decision on risk. Of course if you don't make those decisions, you'll end up with a humungous (I'm not sure if this is an actual word, I think it is, but it has a vernacular use in Australia than means 'huge, bloody huge'!) volume - and then I would ask you why you are bothering to volume at all, and shouldn't you just whack on a pair of those saliva-sapping open fields and save everyone's time and trouble? Of course to do this you would have to stop telling yourself that you are very advanced because you are using IMRT! Oh, excuse me, I stepped on your ego, did I? I apologise! the nodes do not lie in the muscles, the bones or air. The process ends with the production of the PTV which is specified in a PTV+dose format (e.g., PTV70, PTV60, etc) which includes the expansions for movement and the CTVs that need to get a particular dose. Rather than using boosts, I use dose painting by specifying PTV70 and PTV60 on the same plan. The difference is that the CTVn0 is included in the PTV60 but excluded from PTV70. I differentiate non-cancer involved organs into two groups: the organs at risk and the critical organs. critical organs are those that pose a great threat and must be excluded. The organ most exemplified by this status is the spinal cord. In this case the organ is volumed and its movement accounted for by expanding the anatomical structure to form a new or planning restriction volume called the spinal cord PRV. organs at risk are those that will usually experience collateral damage of a more trivial nature and where the dose must be controlled to be ALARA (in the case of the parotid the literature says "mean dose of 26Gy" but I aim for an ALARA dose and we often achieve mean doses at the 16-18Gy level. So OARs are treated somewhat differently, although they are marked strictly anatomically also. the OAR part outside the PTV and outside the penumbra. Now this part is the only part where you can tailor the dose deposited! But remember that OAR in this area moves by the same as the tumour in daily set up. If you wish to confer on the drawing of structures on actual CTs, let me know and I'll load some pictures. The program INKSCAPE is very useful for its drawing capability. 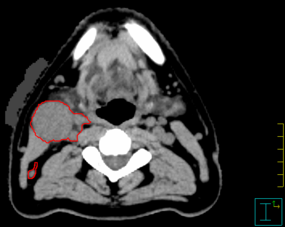 An example is provided below where I imported the CT and then drew over the top of it in a vivid colour. Followed by an export into PNG format.